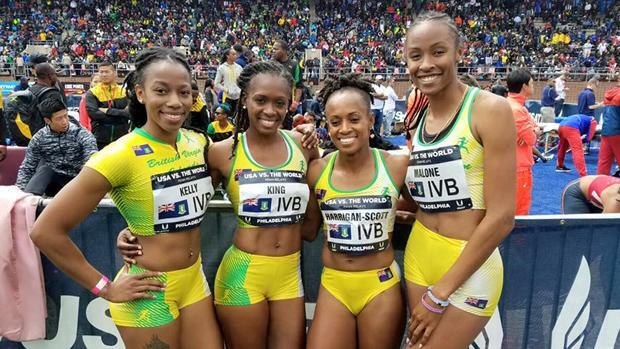 The British Virgin Islands quartet of Ashley Kelly, Tahesia Harrigan-Scott, Chantel Malone and Karene King, competed at the prestigious Penn Relays in the USA vs the World 4x100m relay on Saturday. They finished sixth in 44.97 seconds. At the NTC/Pure Athletics Spring invitational in Clermont, Fla., Lakeisha 'Mimi" Warner was second after chopping her her 400m personal best from 55.88 seconds earlier this year to 54.96, becoming the seventh BVI female athlete under 55.00 seconds in the process. Judne Lacey was fourth in the same heat in 57.46. Tarika 'Tinker Bell' Moses won section 4 of her 200m heat in a personal best of 24.14 seconds, while Jonel Lacey lowered her three-year old best from 24.68 to 24.20, to finish fourth in section three. Warner and Moses qualified for the July 19-24, IAAF World Jr. Championships in a second event, with their respective marks. Warner's 58.14 seconds at the Carifta Games qualified her in the 400m Hurdles, while Moses' 53.72 in the 400m, also came at Carifta. Both of their Carifta marks were personal bests. At Monday's Sunshine Invitational Sprint meet in Miami's Tropical Park, Moses followed up her 200m personal record by shaving .06 off her 400m best in winning the event in 53.66 seconds. Jonel Lacey became the eight BVI female under 55.00, when she obliterated her 55.78 personal best from earlier this season with 54.76. Harrigan-Scott used a windy 11.28 to win the 100m final, after advancing with 11.55. King who did not contest the 100m final after a seasons best 11.64, won the 200m in 23.61. Warner ran 2 minutes 13.27 seconds to win the 800m. Adaejah Hodge qualified for the Georgia State Championships after excellent showing in the Smyrna District Championships. After stumbling out the blocks, she won the 100m in 14.03 seconds, then placed second in the 200m in 28.32 seconds and leapt 12'11" a mark good for second in the Long Jump. The state championships will be held on May 14. Central Arizona sophomore Tynelle Gumbs, won the Region One Championships Javelin Throw and Hammer Throw on Tuesday. She had a mark of 40.57m in the Javelin and 52.21m in the Hammer. Twin sister Trevia placed third in the Hammer with a distance of 46.24m. On Thursday, they will compete in the Shot Put and Discus Throw. They will wrap up their Jr. College career at the National Jr. College Outdoor Championships, May 17-19, at South Plains College in Texas.